You must have heard a lot about Bali as a small beautiful island and a part of Indonesian archipelago. It has become one of the most popular destinations for pre-weddings and weddings, and it’s also a top honeymoon spot. Here we are going to share some amazing locations that you should know if you are having your photoshoot in Bali. Danau Tamblingan is a lake located in the northern side of Mount Mortar. It is best to go there at first light, to catch the sunrise and morning fog rising off the lake. You can rent a canoe there and sail out to a wooden platform in the middle of the lake. Not far from Danau Tamblingan, there is a Gubug Temple, which is also an amazing spot for your photoshoot. Melasti beach is one of our favorite spot for photoshoot session. It is located below a high cliff in the region Ungasan. The best time to go to Melasti Beach is in the afternoon, as you can see the beautiful sunset here. 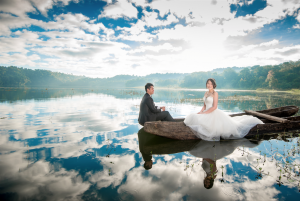 Mangrove forest has become one of the most favorite place for prewedding photoshoot in Bali. It will be best to come and get your photos done in the morning from 09.00 to 11.00 or afternoon time from 16.00 to 17.30. The entrance fee for photoshoot session will be charged Rp. 500,000 for all crews and couples. 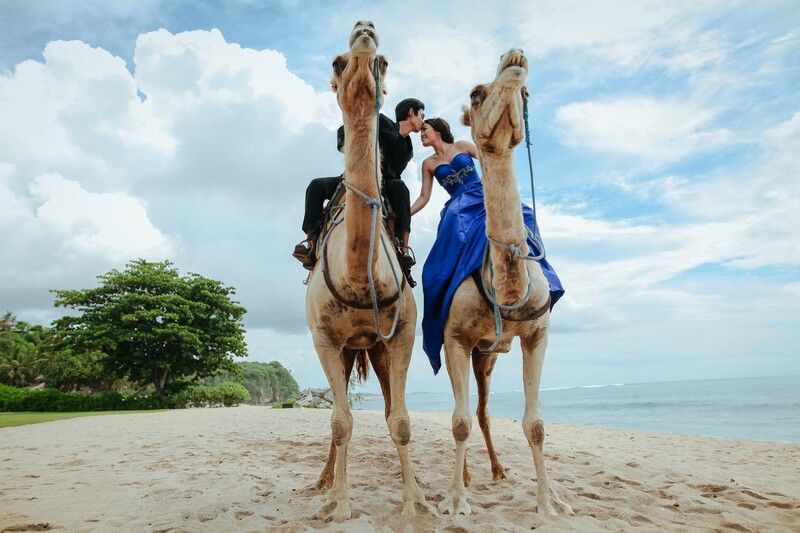 Prewedding photoshoot at Grand Nikko Bali has to be done with the camels supported with the beautiful view of the white sand beach. You need to book in advance and not to be late to use the camels as you only have 30 minutes slot to shoot with a pair of camels. These camels will be guided with professional camel handlers to assist you to get the most exotic photos. 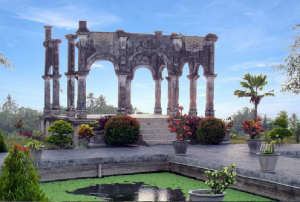 The Water Palace of Taman Ujung is located in Karangasem, Bali. If you are using car, it will take around 2 hours drive. It becomes one of the famous place for prewedding photoshoot because of the architecture of the palace. The tranquil old temple is surrounded by a maze of pools, fountains and garden. Bali is famous of its nature and culture. So these are the top 5 most popular locations in Bali, but of course there are a lot more places that are as beautiful as the ones that we stated above. Now that you know some locations for your photoshoot session, you can start planning the theme and props that are needed for the photoshoot. It is best to ask opinion from your photographer to guide you to find the best for your photoshoot.